ST. GEORGE — The Utah Board of Tourism Development, part of the Governor’s Office of Economic Development, has announced that it is allocating more than $3.4 million in cooperative marketing matching funds to help communities throughout Utah promote their areas to out-of-state travelers. Of these funds, various initiatives in Southern Utah will receive almost $1.2 million. Cooperative marketing, known as “the co-op” within the tourism industry, pairs with the Office of Tourism marketing and branding campaigns to build a robust tourism economy. Last year, visitors spent $8.17 billion in Utah, generating $1.15 billion in state and local tax revenues. Co-op awards will be used to promote a huge range of state recreation, culture and scenic byway treasures. The tourism board’s co-op committee meticulously reviewed and scored 68 applications from eligible nonprofits in 21 of Utah’s 29 counties. Some initiatives spanned more than one county, including $14,368 for the Zion National Park Forever Project and $1,892 for Utah’s Patchwork Parkway (state Route 143). For a complete list of awards, including specific initiatives for each county, click here. While there are national parks included in this list, according to a press release from the Utah Office of Tourism, a key strategy when making the determinations was to distribute visitors off the beaten path. This builds the economy in areas that have capacity, creates a quality experience for visitors and protects quality of life for residents. The balance is especially important in the Moab and St. George/Springdale areas, where Arches and Zion national parks are receiving record visitation. To that end, 76 percent of co-op grants went to communities without a national park. 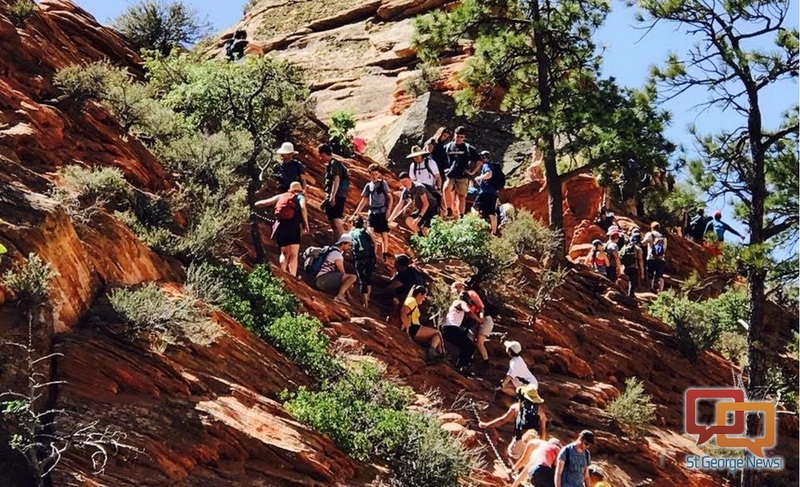 However, Roxie Sherwin, director of the St. George Area Tourism Office, said Zion is still a cornerstone of their initiatives, many of which are focused on bringing people visiting from other countries into Southern Utah, especially during the off-season. Once they’re here, Sherwin said, they work on promoting other aspects of the area outside of the park, including guide services and winter activities. One of the St. George tourism office initiatives, Southern Utah Winter, is a cooperative effort with Garfield and Iron counties to advertise skiing, snowmobiling and snowshoeing in Arizona, California and Nevada. Most of those folks will come over for two to three weeks, and they’ll ski. But they don’t ski for two weeks. Then they look for other things to do, especially the Germans. They’re very much outdoor people. So for them to ski for a few days and then drive four hours and hike and climb and enjoy national parks is a pretty nice getaway for them. Utah tourism marketing is funded through the Tourism Marketing Performance Fund. The fund can be increased by up to $3 million per year if rigorous performance measures are met. Performance measures have been met every year for the last five years, and the Legislature has funded increases in four of the last five years, bringing the total fund to $21 million. Some $4.4 million in applications met rigorous performance measures to qualify for co-op funds. With $3.4 million available to allocate, the tourism board had to make difficult choices, the press release stated. Applicants received 70 to 85 percent of their total requests, despite return on investment calculations demonstrating a larger allocation could have generated more revenues for regional economies. Funds are fully distributed only after Return on Investment reports are submitted. In addition to co-op grants for local marketing initiatives, the board allocated approximately $850,000 in cafeteria co-ops, which will assist local communities build tourism websites, generate photos of their areas, execute social media and other key initiatives. Collectively, 27 of Utah’s 29 counties received a traditional or cafeteria co-op grant. Yeah, let’s not ruin only Zion, Bryce and Arches…..let’s pay the outlying towns inbetween to do the same….what a horrible waste. only to make a short term buck, regardless of the long term effect on the local communities as to over crowding and endless traffic jams. Wow! all this Money coming to us…It is like Christmas from the Governor….Then you remember it is Our Taxes that was taken, and Now all bundled up with a nice Big Government Red (Tape) Bow. Joy! (you just have to wonder how much of this money will be channeled to certain “friends” of local and state politicians? Hope there won’t be more people tromping through Kanarraville’s water when they flock to see the falls! Outdoor activity is great but with it comes responsibility. Those who befoul water and put graffiti on our public lands should just plan to stay home.